After inspecting the M3 Sedan following my latest track day (NASA at TWS) I found a couple hoses starting to deteriorate. 16 year old rubber is going to start showing its age, that’s no surprise, I’m always on the lookout for it. What I discovered was the intake boot running from the HFM (aka MAF) to the ASC throttle body was starting to split. I removed it to inspect further, where I noticed that the rubber hose that connects the boot to the IACV was also split. I could have replaced both with identical stock parts, but for the same price I could go ahead and complete a common modification: delete the ASC Throttle Body. I won’t go into the details of what the ASC throttle body does, it’s been discussed ad nauseam across the interwebs. In the plainest of terms: it serves as an additional throttle body in front of your normal pedal controlled throttle. When the car senses you losing traction, it can close thisASC throttle body independently of what you are doing with your foot. The system is one of earliest designs in traction/stability control and has since been supplanted by drive-by-wire systems that no longer require an additional throttle body. 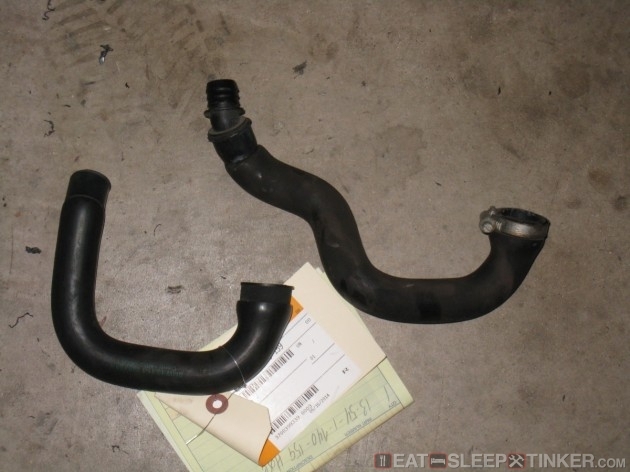 The downside to this system is that it becomes an added restriction to the airflow into the intake manifold, especially with its location in the bend of the intake tract. Even when wide open, its oblong throttle plate obstructs the air prior to reaching the traditional throttle body. This in turn can reduce throttle response. So removing it sounds like a no brainer right? Well, for most folks who strictly street drive their cars or drive in regularly icy or wet conditions, they may want to retain the stock ASC for an added margin of safety. I, however, have found the system to be more nuisance than convenience. I turn it off whenever on the track (in all my cars) because the intervention threshold is so low that you are constantly being robbed of power, as well as creating more brake wear and heat than necessary (the system interacts with ABS.) 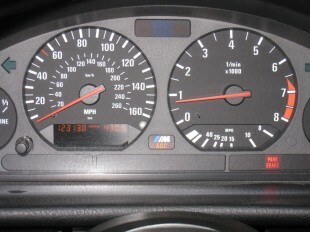 Additionally, the E36 M3 isn’t so powerful that it is hard to control, even on low traction surfaces. It helps being a very balanced chassis. If you need further motivation to complete this modification: it’s 100% reversible. There’s no cutting of wires or drilling or otherwise damaging anything. Now let’s get that sucker out already! This modification couldn’t be more simple and there are untold numbers of DIY’s and How-To’s out in the ether, but I have one additional recommendation that I haven’t seen others do. First let’s get the parts, and you’ll only need two. 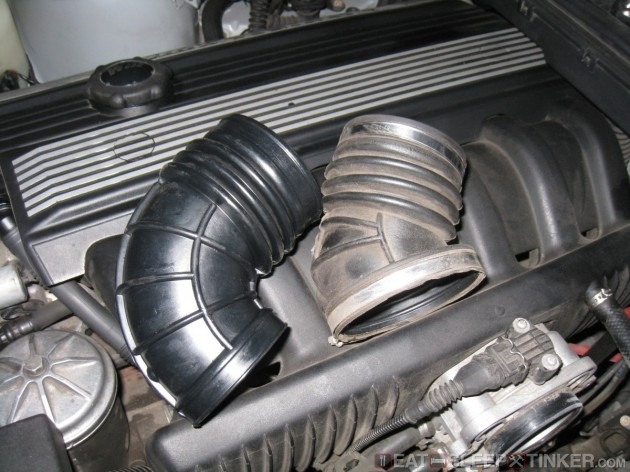 One is a replacement rubber boot from an S52 M Roadster, which didn’t utilize the same ASC throttle body. 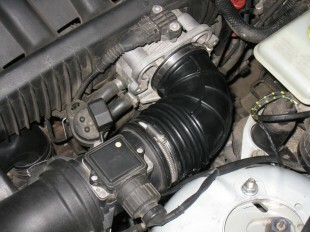 The other is the IACV hose from the same car, so that it will properly line up. That’s what I haven’t seen others use. Sure you could contort your standard E36 IACV hose, but chances are it’ll be rotten like mine or will rub on the throttle cables. Too cheap and easy to just do it right. Here’s a comparison of the new (left) Z3 non-ASC boot next to the older boot. Not only do you have theASC throttle plate creating a restriction but also this poorly routed boot. 1. 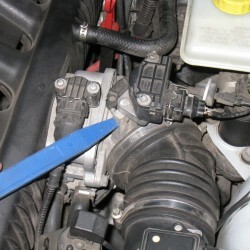 Remove the HFM (MAF) connection to the airbox by unfastening the two spring clips. 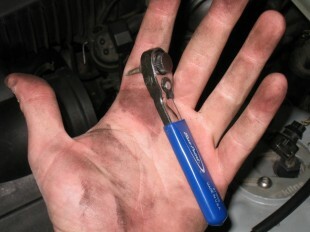 Then remove the old intake boot by loosening the two standard worm clamps with a flat tip screwdriver. The IACVhose has a plastic hose barb pushed into the bottom of the elbow and should come out with little force. Toss in garbage if deteriorated like mine, save if you ever think you’ll want to put it back to 100% stock. 2. 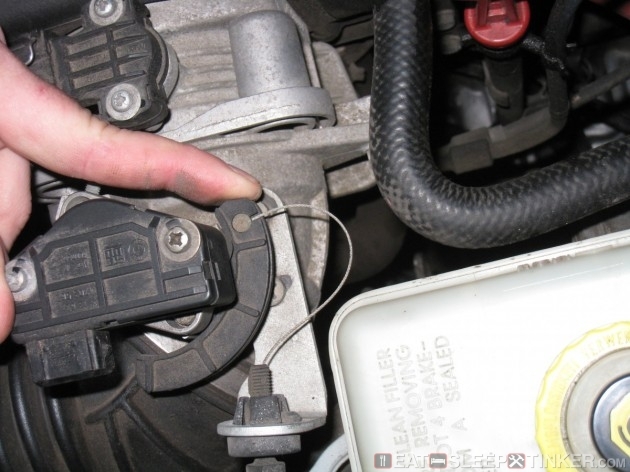 Disconnect the ASC throttle cable from the throttle body. Remember there are two throttles and therefore two throttle cables. You shouldn’t get confused, as the one you want runs directly to the top of the ASC throttle body. To remove it, simply open the throttle plate by pushing the bellcrank towards the cable bracket, then you can slide the end of the cable out. Then you just remove the cable from its bracket. I could spend some time telling you how but just get it out. 3. 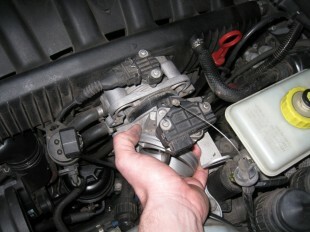 Unplug the electrical connector from the top of the ASC throttle body. By unplugging this connector, the ASC system can no longer function. Everything, to include ABS, will operate normally. To protect this connector from water intrusion, I wrapped it in self adhering silicon tape, then zip-tied it neatly out of the way. 4. 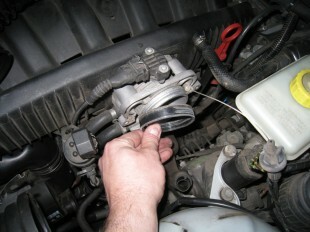 Now remove the actual ASC throttle body, which is held on with two bolts. You can now lift out theASC throttle and pack it away in case you ever decide to go back. 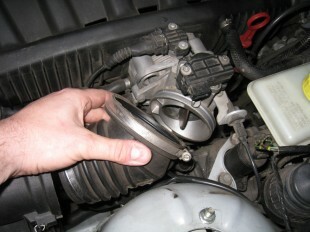 Also don’t forget to remove the flat rubber gasket from the main throttle body, as it will no longer be needed. 5. The old IACV hose comes off next. This is probably the most difficult part due to the confined working area under the intake manifold. 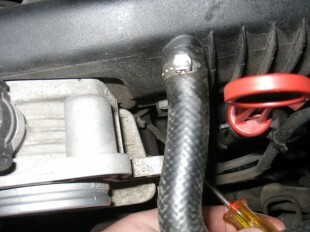 The hose is secured to the IACV with a worm clamp just below and to the right (as you face it) of the throttle body. In the photo below and to the left, I’m pointing to it with the tip of the screwdriver. A ratcheting bit driver like the one on the right makes the job easier. 6. With the old IACV out, you can take off the original clamp for use on the new one. You’ll also pull off the angled plastic hose barb and move it over to the new hose. 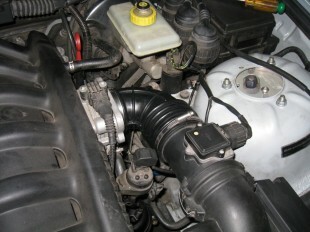 You can now install the new Z3 hose back on the IACV. In the photo below you can see a comparison of the newer hose (left) and original. 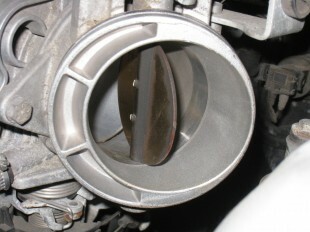 The newer one is made to line up properly with the newer Z3 intake boot rather than contorting the old one into place. 7. Time for the new intake boot. It goes on just like the old one came off. 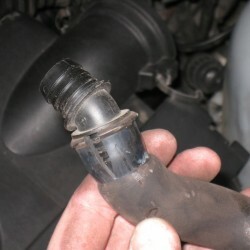 With the proper IACV hose, the plastic barb should be properly positioned beneath the hole in the boot. Make sure you don’t forget to insert it until it’s flush. 8. Finally, tuck away the (now) loose end of the ASC throttle cable. You should be able to find a good spot right next to the actuator that it sprouts from. A zip tie can be used to keep it in place and hidden. NOTE: You can remove the actual ASC throttle actuator, but it will create faults and issues with your ABS. 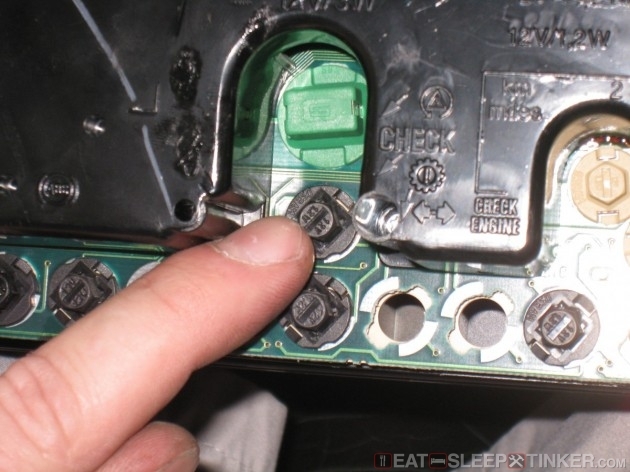 To get around this you must solder in a resistor to the actuator’s plug. After a lot of reading, I determined that this wasn’t the best solution. It’s much easier to just tuck the throttle cable out of the way, especially if you ever intend on going back to stock. And no, the actuator will not be moving the throttle cable back and forth, the system is in effect constantly off since it no longer senses the ASC Throttle Body. 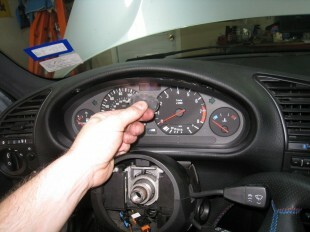 Optional Step: With the ASC out of commission, you’ll have a constant ASC light illuminated on your dash. There’s no real harm in this, but I find it annoying. 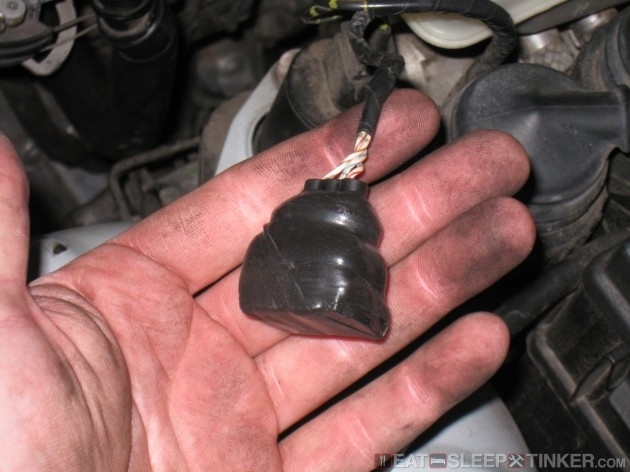 The simple fix: remove the bulb. To do this I first removed the steering wheel. Then the two small screws at the top of the cluster. It can be difficult to pull the cluster out, I found a small suction cup that works nicely. And here’s the bulb you must remove. Pull it and then re-install everything just as it came off. Crank it up and check for any issues. After a quick test drive I immediately noticed an improvement on throttle response, mostly when bliping for downshift rev-matching, but it is appreciable. Otherwise, especially with the ASC bulb removed, it is a very transparent modification. I no longer have to remember to push the ASC button prior to entering a track!